This is the scene that sparked my interest in gesture recognition technology. It’s a clip from the mostly forgettable mid-90’s Sci-Fi clunker Johnny Mnemonic adapted from a story by William Gibson. Keanu Reeves plays the title character, a man with a cybernetic brain implant designed to store data, allowing him to act as a courier of information deemed too sensitive to transfer across a souped-up virtual reality version of the Internet dubbed “The Net”. Here’s a factoid for you: Dolph Lundgren played the villain and was stuck in Direct-to-video Purgatory, not acting in a film with a theatrical release until 2010’s The Expendables. That’s how good it was. Nevertheless, watching Keanu hacking is way into a Yakuza account by flailing and flapping his hands and wearing totally funky fresh VR goggles absolutely blew me away. You have to understand, the Internet was a relatively new phenomenon back then—AOL ruled the landscape when this film premiered—and virtual reality was strictly a Star Trek: Next Generation plot device. 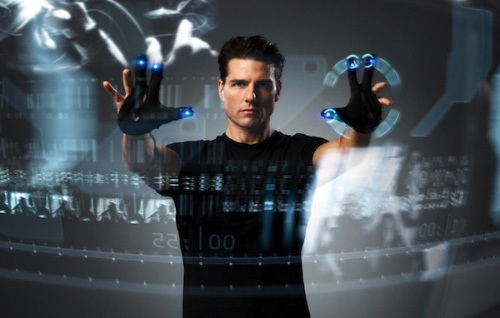 Over the next decade Hollywood blockbusters Minority Report and the Iron Man series pushed gesture technology even closer to reality by inspiring scientists and programmers who took on the challenge of creating the “spatial operating environments” and “holotables” depicted in the films. Gesture recognition is described as interacting with computers by using gestures of the human body, typically hand movements. In gesture technology, a camera reads the movements of the human body and communicates the data to a computer that uses the gestures as input to control devices or applications. Even onscreen the tech evolved in the few short years between releases. Tony Stark ditched the gloves John Anderton was forced to wear and was able to build his armor with barehanded computing abandon. As fanciful and mind-blowing as the gesture tech appeared on the silver screen, the introduction of gesture recognition tech to those of us living in the real world was more modest. The Wii console controllers and Microsoft’s Kinect for the Xbox, introduced gesture tech directly into our living rooms. Now we can all gesticulate and prance about like the narcissistic billionaire arms dealer with a weak heart we were destined to be.